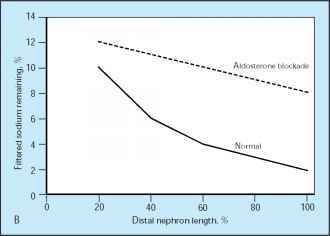 Effects of aldosterone on distal nephron sodium reabsorption. A, Mechanism of action of aldosterone. Angiotensin II also is a very powerful regulator of aldosterone release by the adrenal gland. The increased aldosterone levels synergize with the direct effects of angiotensin II to enhance distal tubule sodium reabsorption. Aldosterone increases sodium reabsorption and potassium secretion in the distal segments of the nephron by binding to the cytoplasmic mineralocorticoid receptor (MR). On binding, the receptor complex migrates to the nucleus where it induces transcription of a variety of messenger RNAs (mRNAs). 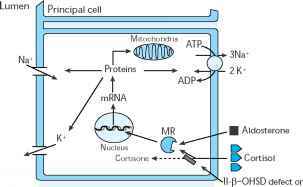 The mRNAs encode for proteins that stimulate sodium reabsorption by increasing sodium-potassium ATPase (Na+-K+ ATPase) protein and activity at basolateral membranes, increasing mitochondrial ATP formation, and increasing the sodium and potassium channels at the luminal membrane . Growing evidence also exists for nongenomic actions of aldosterone to activate sodium entry pathways such as the amiloride-sensitive sodium channel . B, The net effect of aldosterone is to stimulate sodium reabsorption along the distal nephron segment, decreasing the remaining sodium to only 2% or 3% of the filtered load. 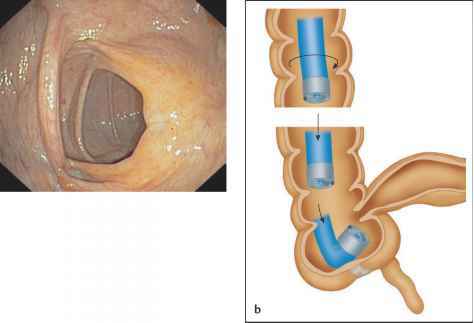 The direct action of aldosterone can be blocked by drugs such as spironolactone that bind directly to the mineralocorticoid receptor.